The past two weeks have been almost non-stop work for me but today, today is a day off :) Yippee! I started with a standard size white card base. 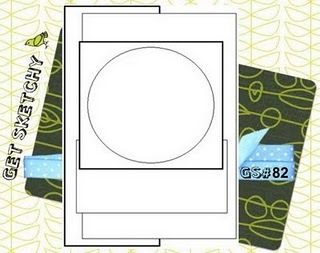 I cut a piece of yellow pattern paper (Soup Staples collection)﻿ to 2 1/4 x 5 1/2 and adhered it to my card base. I created the teal piece by scribbling my teal marker (Marvy Bold) on my craft mat, picking it up with my H20 pen (lots of water) and coloring a white piece of card stock until I was happy with the result. adhere flat. The punched (EK Success) a 2 x 4 piece of white and adhered it to my card. The navy square was cut to 3 1/2 x 3 1/2 and glued down. I created the rosette by scoring every 1/4 inch on white card stock cut to 1 1/4 x 11. 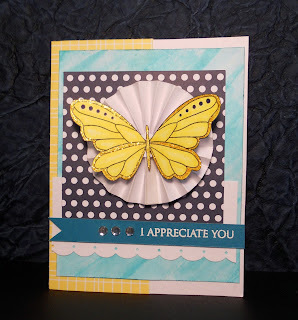 I stamped the butterfly (Hero Arts, Butterflies) on white and colored it with a yellow marker. I fussy cut it out and attached just the body to my rosette. I cut the teal (DCWV, Cafe Mediterranean) to 1/2 and stamped my sentiment (Hero Arts, All Occasion Messages) in versamark. I then heat embossed in white. I cut a V to make a little banner and added it to my card with foam. Some clear rhinestones and yellow stickles finished it off. This card is a little different for me . . . . what do you think? Gorgeous! Love your butterfly over the pleated circle! Beautiful layeering, too! GREAT take on the sketch! Woohoo! Congrats on your win at Get Sketchy! !